Reflective tapes are the unsung heroes that prevent accidents on highways and in parking lots. They increase the visibility of large road obstacles. In December 1992, the NHTSA published a Federal law instructing trailers and semi-trucks to have a reflective tape which is at least 80 inches wide. The intention was to cut down accidents caused by poor visibility. However, there are many reflective tapes in the market but not all that adhere to DOT safety requirements. We spent hours on research, reading both amateur and professional reviews to come up with the best choices of DOT approved reflective tapes. These tapes come in two types: Red and White striped which hare used at the bottom and back of the sides of trailers. They must be 2″ wide. The white or silver reflective tape is supposed to be used at the top and back end of a truck. But there are various types of reflective tapes. However, for a tape to meet DOT safety requirements, it must have a ‘DOT-C2′ on the label. We mostly associate a reflective tape to commercial vehicles. But there are various applications in which you can use a DOT reflective tape for your office or home. You can back into a mailbox if it’s not well marked. For your safety, mark the mailbox at the sides, top and bottom. Have you ever missed a driveway because it was too dark and you could not see it? It can be a scary event. Save yourself some trouble by marking the path with few strips of red and white reflective tape. Backing into a trash barrel can be a hurtful way to start or end the day. You don’t need to keep guessing where your can is placed. Don’t go hunting for it at night lest you find yourself in a ditch. Instead, you save yourself the hassle and time by marking the barrel with a highly reflective DOT tape. There are DOT tapes which can stick on clothing. If you’re a runner or jogger, you will easily be seen from far and prevent you from being bumped on or avoid crashing on others who are on track. A DOT reflective tape can be effectively used to mark hazards or safety areas in warehouses or factories. Underneath drop hazards, clearance zone surrounding high voltage equipment are some of the potential applications. The tape can be used in conjunction with vinyl tape for added attention. Using a reflective tape on the topside, sides, and undersides will make your craft visible from far. Protruding edges and out-jutting parts are the ideal places to stick a reflective safety tape. When posts and bollards are installed on a low light area can cause accidents. To increase their visibility and prevent potential accidents, they can be covered with a reflective tape that reflects even on low lighting. When it’s foggy, and during winter, it can be quite dangerous for kids walking along roads. Reflective tape embroidered on the bag will increase the kid’s visibility to trailers and cars and prevent them from getting knocked down. That will also make the child visible when riding a bike. If the color of the bag is red, use a silver tape to create a contrast. Why we like it: 2″ X 50 ft. DOT Approved Reflective Safety Tape by Typhon East is adhesive to adhere on any surface, whether wood, metal or plastic. The red and white color makes it highly visible. The tape is water and, but you have to install it on a dry and clean surface. It’s is a versatile reflective tape that can be used on motorcycles, automotive, trailers, bikes, vehicles, and even on helmets. This DOT approved reflective safety tapes is made of UV resistant plastic material with adhesive backing. It can stick on any surface including wood, plastic and metal, which can add safety and style on vehicles. Its water and weatherproof nature make it remain in place for years on trailers, helmets, automotive, and even on motorcycles. Applying this DOT reflective tape on any surface is simple and hassle-free. If you want to use it on your trailer, choose the place you want to stick it and clean it with soapy water. Rinse and dry it thoroughly. This is to ensure no grime or grit remains in the working area. You can use a squeegee to press it firmly. When it comes to clarity, this tape exceeds industrial expectations. Typhon East DOT approved Reflective safety tape is designed with red and white color. It can be perceived when illuminated by low-light source. It can be seen from over 900 feet away making it excellent for high-way application, where it shines through rain and snow. When it comes to choosing the best reflective tape, strength becomes a priority. If you are thinking of getting a durable reflective tape, then Typhon East DOT approved reflective tape is the game changer. 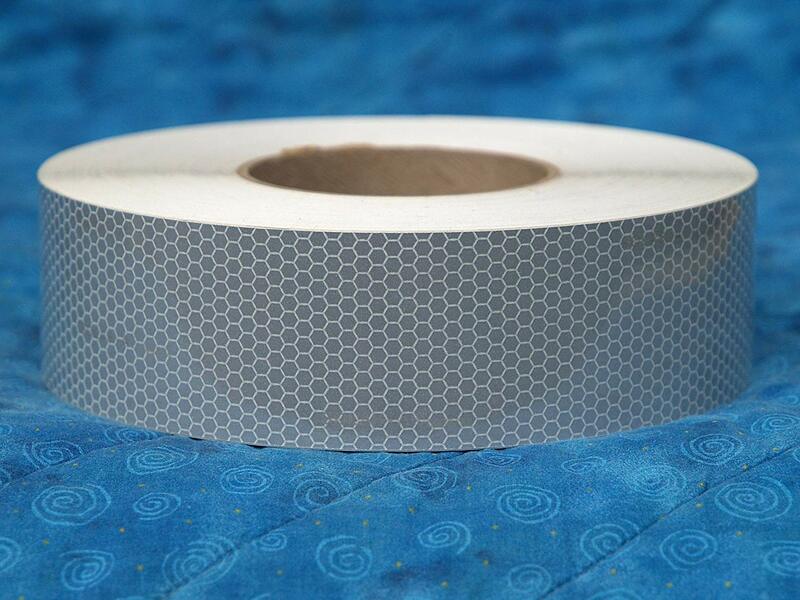 The UV resistant, ultra-reflective and honeycomb pattern design made of PET material makes the tape to withstand extreme temperatures and bad weather. Are you looking for a reflective tape for your trailer or motorcycle? Well, you have got the right product. The tape is specially designed to stick on any surface and can be used on different gadgets. You can adhere it on your bike, RVs, and helmet. The tape is also used in marine to make ships visible. It can also be applied on agricultural equipment like tractors, lawn mowers, grain dryer, and even on combine harvesters. If you’re looking for a versatile, durable, and high-quality reflective tape, this might be your ultimate solution. It is DOT approved; thus you won’t have to worry about its safety. It can withstand extreme weather conditions. Why we like it: DOT C2 Conspicuity tapes has a generous size of 2″ width and 30 feet length making it big enough to be visible from many miles away. The high visibility red and white color makes it the best tape to be used on the highway. The PET material used in designing this tape gives it excellent durability, and it can withstand various weather conditions- both good and bad. It has high adhesive strength to make it stick on various surfaces. Conspicuity reflective safety tape is specially designed with PET material which allows it to be mounted on any surface. You can easily stick it on metal, plastic, wood, and nylon. It is built for US DOT requirements on trailers. However, adhesion might not be ideal for concrete, especially if it can get wet. But if you rivet or bolt a metal on the pavement, you can install it. Conspicuity safety tape has a simple design that makes it easy to install and stick on the surface of your choice. You can also easily peel it back. It’s not affected by heat or rain, thus remaining intact for long. By sticking it on your own will prevent you from hiring a professional, which is a great way to save a few bucks. The US DOT requirements indicate that reflective safety tapes should be visible from far and on low and high light. This is to prevent accidents. The diamond shape pattern provides high visibility. The red and white color offers additional attention to alert others in hazardous areas. Its visibility will also enable you to go about your task even on the darkest nights, giving shine of over 1,000 candles. Durability is one of the best features that set this reflective tape at a competitive edge. The manufacturing company has over ten years in providing high-quality and long-lasting reflective tapes to customers. The tape is heat and water-resistant enabling it to withstand adverse weather conditions. 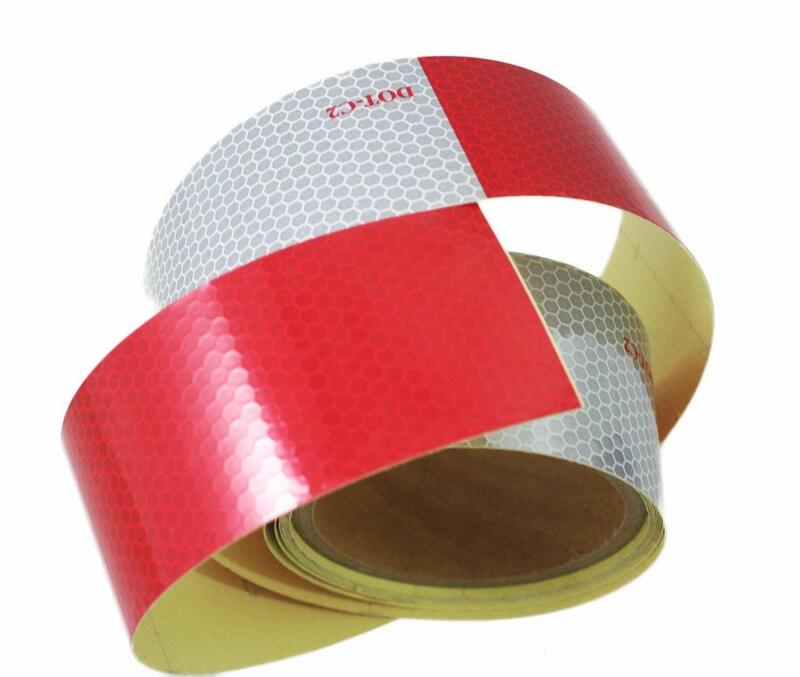 This is a retro-reflective marking tape that can be used widely on cars and truck. It can also be used on construction signs and temporary signs on the roads for night physical activities. In addition to that, it can be efficiently used on ships, boats, and in guide and traffic facilities signs. Conspicuity reflective has proved to be extremely durable. It’s sturdy yet affordable. If you want a highly reflective, high-quality tape for your trailer, this tape will serve you the purpose. Why we like it: This is a highly protective safety tape that is DOT approved. It provides ultimate visibility. Weather-resistant diamond grade pattern makes it resist grime, greases, dirt and rain. The tape is highly reflective, and the yellow color makes it visible form 100 miles away. In addition to high-quality and great style, the tape is also versatile to allow it to be used on poles, signs, mailboxes, and on any other surface that need bright reflective safety tape. 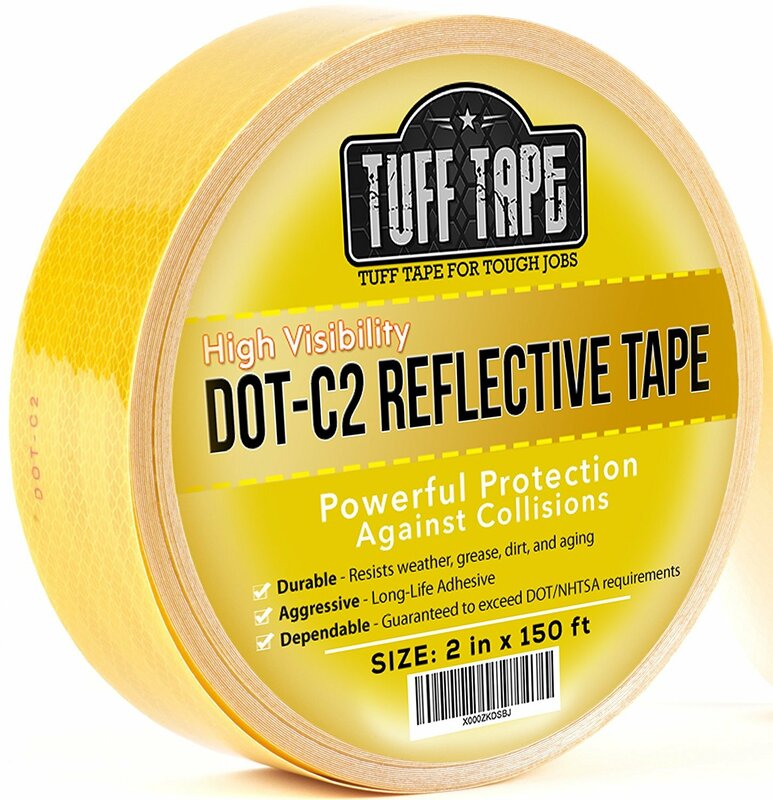 The DOT Reflective Tape DOT-C2 Conspicuity Yellow diamond grade tape sets standards for all reflective tapes in the market with its aggressive adhesion. It was explicitly designed to provide long-lasting adhesion even under adverse weather conditions. It has approximately .23mil of pressure-activated adhesive. It will stick very well on a clean surface and can only come off when purposely removed. Not even mud, rain, or grease can make it fall off! Do you want a Do It Yourself reflective tape? This DOT-C2 is your ultimate solution. It has a paper backing, and you can easily peel it off. For a simple application, clean the surface with soapy water or alcohol to ensure no grime, grain, or grease is left on the surface. Stick it safely and be ready for a safe ride even at dusk. However, it cannot stick on porous concrete unless it’s mirror finished. DOT-C2 Yellow tape has been re-engineered with a bright color to provide high visibility. It will help you stand out on high-way or when parked. Its high reflectivity separates it from the competition on clarity. DOT-C2 diamond grade pattern is designed to resist rain, grime, dirt, sun-fading, and grease. It is heat and water-resistant making it last for long. It forms a strong bond with the surface to ensure it doesn’t disappoint you. Its generous size of 2″ x 150 feet means whether it’s on a guard-rail or a trailer, it got you covered. It’s an excellent outdoor tape that can be applied on poles, road signs, mailboxes, guard-rails, and other places and on objects that requires bright and highly reflective safety tape. If you want a high-quality commercial reflective tape, DOT-C2 got you covered. It will stick firmly in a clean surface and last you for long. It’s highly visible even on a low light for your safety. Why we like it: ABN Trailer reflective tape comes at an affordable price with a bright pattern to make it visible. It’s DOT-C2 approved, so you don’t have to worry about DOT safety rules and regulations. More so, it allows a flexible application and can withstand extreme temperatures. It is a highly versatile tape that works great for trailers, RVs, clothing, boats, cars, and mailboxes. ABN Trailer Conspicuity reflective tape forms a solid bond with the surface which is applied n. It has been re-engineered to stay in place for longer, even though rain and storm. Its material is heat and water-resistant to ensure it remains in good shape and prevents it from fading, shrinking, or peeling off. The tape weighs 1.6 ounces and measures 2 x 3.8 x 3.8 inches. This makes it a heavy-duty reflective take. However, you can easily apply it on your preferred surface even on clothing. You can easily cut it off using a pair of scissors. Its single layer design makes it flexible when applying. Being a weather-resistant product, it means it’s ideal for outdoor application and grime, or grains or dirt will not tamper with it. If you want to peel it off, you can use a heat gun or hair dryer to warm it up gently and then peel off. 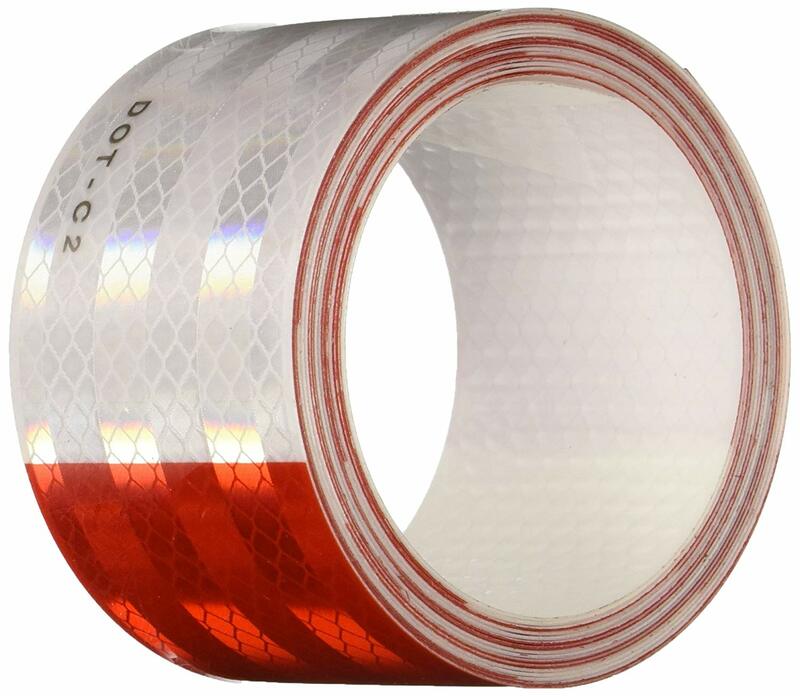 This continuous roll has a bright pattern of 6″ red and 6″ white honeycomb reflective pattern. It is a practical choice when you need extra visibility. With this tape, your vehicle can be easily seen when parked. It will make the trailer, clothing, or mailbox illuminate like bright stars. ABN trailer Conspicuity is notoriously known for being a top-notch performer in all weather conditions- rain, storm, and extreme temperatures. It’s durability that exceeds that of other reflective safety tapes in the market. With aggressive adhesion and excellent ability to withstand adverse weather condition, the tape will stay in place and last for long. The tape is DOT-C2 approved and suitable for indoor and outdoor applications. It is a sturdy product that has been designed with safety in mind. Apart from its easy applicability and adherence to weather conditions, it can be easily used on trucks and trailers. It is also used in boats to alert other marine equipment. It can be used on campers, RVs, mailboxes and even on clothing. ABN Trailer Conspicuity DOT-C2 Approved Foot Reflective Red/White Tape comes with a classic red and white style. It allows you greater customization. Since it can be used on clothing, it becomes a perfect item for joggers and runners who want extra safety while out after sundown. All these features come at an affordable price. Adherence to the DOT regulations. Why we like it: Improve road safety and maximize visibility with the help of a durable 3M DOT reflective safety tape. It’s designed by a reputable company- Safe Way Traction- which has exclusively adhered to Department of Transportation safe rules and regulations. It has pre-mask pre-cut stripes with a liner to make it easy for application. The product is relatively affordable for people who need to protect their mailboxes or fens from unwitting drivers. What will wow you about this product is its 12-foot rolls which will offer you ample coverage. 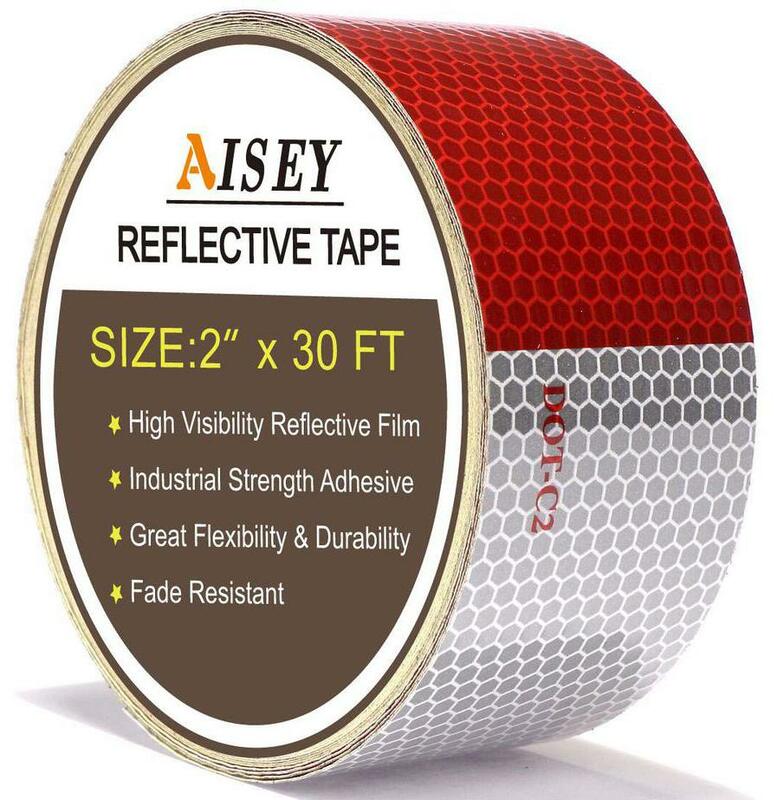 Adhesion is on the best quality this reflective tape has. It places it at a competitive edge. 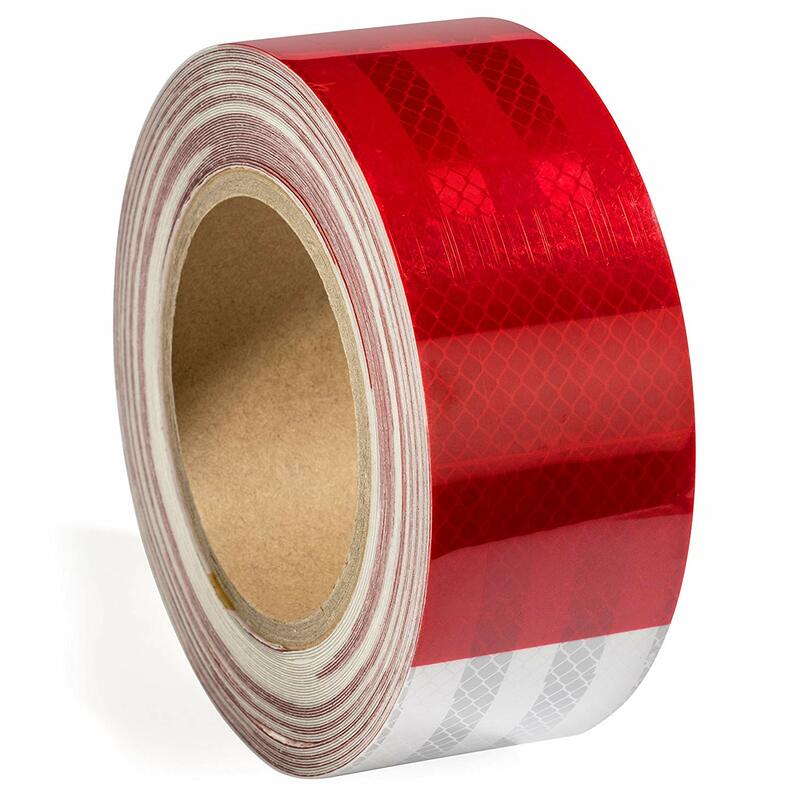 Safe Way Traction Diamond Grade Conspicuity Red and White Trailer DOT-C2 Tape have aggressive adhesion which allows it to stick on smooth surfaces for months. It will stick better when you apply a little pressure using a squeegee. If you want to use it on a porous concrete, you can rivet a smooth metal and stick on it. This Diamond grade conspicuity DOT-C2 safety reflective tape is made of microprismatic sheeting with high-pressure sensitive adhesive. It makes it easy to apply on various surfaces. You can use it on large vehicles, trailers, and trucks. For a smooth and seamless application, rub the surface with alcohol or soapy water to clean grease, grime, and dirt then stick it. The 3M 983 series reflective tape is designed with a unique 6inch red and 6inch white pattern to make it visible from far. It shines over 1,000 candles to alert other road users- either when the trailer is on the highway or when parked. Mark your mailbox with this highly reflective DOT approved tape to protect it from rogue drivers. Tape it all over your boat trailer for safety. It’s super bright even with a dim flashlight. 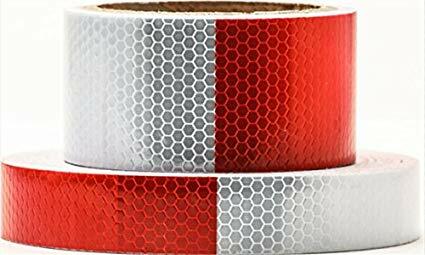 The Diamond Grade Conspicuity Red and White Trailer DOT-C2 Tape is highly durable considering it’s made of sturdy material. It is water resistant making it ideal to be used on boats without peeling off. It’s also a heat-resistant product allowing it to withstand harsh temperatures and sun-fading. It is a multipurpose reflective tape which is DOT approved. You can use it on a mailbox or on the fence to alert unwitty drivers. The item can also adhere on a boat fir safety in the sea or lake. If you’re looking for an effective reflective tape for your trailer or truck, the 3M 983 series got your back. If you have been looking for a roll that will last you for long, then this 12in roll is the ideal bet. It might be pricey, but it will get the job done. Why we like it: When it comes to buying a reflective tape, you need to choose the one that is approved by the Department of Transportation. This product by STKUSA is DOT approved to show that it has met the standards of safety requirements. We also like this tape because it’s self-adhesive which makes it easy to adhere to a smooth, clean surface. Its durability and weatherproof nature will make it withstand harsh temperatures. Besides, it’s versatile to be used on campers, boats, vans, trucks, trailers, and many more. You wouldn’t be happy to realize the tape you bought cannot stick on your boat trailer for safety, or even on a simple mailbox. 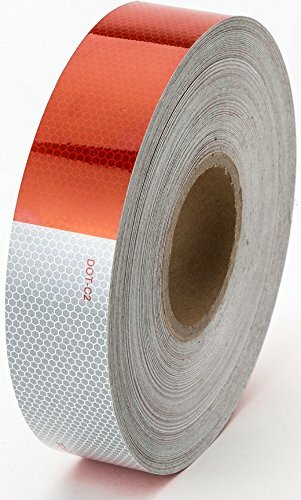 But Auto Car Red and White 2″ x 150″ Safety Reflective Tape has surpassed industry expectation by sticking so well on the chosen surfaces. However, you have to clean the surface and let it air dry before attaching this tape. You don’t need to hire a professional to apply this simple tape on your trailer. All you have to do is to clean the surface clean and let it dry. Ensure there is n0o dirt, grime, or grin to make the tape stick well and smoothly. It self-adhesive nature will make it stick easily. It bonds strongly with steel, aluminum, and painted surfaces. Nearly no installation time is needed compared to conventional prism where holes need to be drilled. If you stick the tape on a mailbox, drivers will be able to see it from mails away to avoid hitting it. It has an ultra-bright honeycomb polygonal prism ergonomic design to allow it to reflect profoundly on guard rails, campers, and even on boat trailers. Measuring 9 x 9 x 9inches and weighing 2.6 pounds, this DOT approved tape is thus a heavy-duty product. This ensures it last long. Additionally, it is resistant to solvents like gasoline, kerosene, and diesel. Weatherproof features enable the tape to withstand extreme weather conditions like high temperature, storm, and rain. The 2″ x 150′ reflective tape is long enough to give you ample coverage. You can use it to safeguard mailbox, fence, a van, and a car. It’s also used by boat riders especially on a low light for safety. Getting a high-quality reflective tape can be tasking. But you here you have what you need for all DOT safety measures. Although it’s pricey, it’s worthwhile. Why we like it: This is a reflector tape which is DOT-C2 approved for your safety. It has a honeycomb design to shine over 1,000 candles. More so, it is made with high-intensity grade glass beads material with red and white color. The material used is sturdy to ensure it lasts for long and cannot tear even on harsh weather conditions. The tape is also designed with over three years’ life span and will look new on your trailer for a long time. Being 100% weatherproof means, it will hold up in harsh weather like snow and rain. The DOT-C2 high-intensity reflective tape by Starrey is one of the best self-adhesive safety tapes in the market. The high-intensity grade allows it to stick on any smooth and flat surface. It cannot adhere to concrete unless you bolt a smooth metal and apply on it. It is weatherproof and water-resistant to ensure it stays in place even when subjected to washing or other harsh weather conditions like rain and snow. Applying a reflective tape has never been this easy. You don’t need the expertise to stick it on a favorable surface. You only need to peel it back and stick on a clean, smooth, dry, and flat area. If you want to use it on the helmet, you’ll be required to cut it into sizeable pieces since it only works perfectly on a flat surface. One of the sore requirement by DOT safety regulation is to ensure that the tape is brightly visible even on a dim flashlight. This is to ensure you’re safe and even other road users. To adhere to these regulations, Starrey designed this tape with high-intensity grade glass beads to enhance undisputable visibility. It reflects brightly from all directions and far away. Grade glass beads material is a high-quality fabric that ensures the tape remains intact even when exposed to unfavorable weather conditions. It’s designed with over three years’ life span. Waterproof and weatherproof features ensure the tape stays in place and good shape for long. 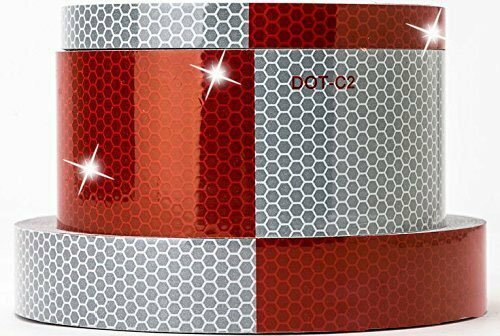 It’s a real DOT-C2 approved safety reflective tape which comes with the red and white pattern. It is an ideal solution for police offers, bot riders, firefighters, truck drivers, and EMS drivers. If you have been searching for a DOT-C2 reflective tape with ergonomic design, high reflectiveness, and excellent adhesion, then this might be your jackpot. High-intensity grade glass beads material makes it sturdy to last you for a long time. Its fair price makes it ideal for individuals working on a low budget. Why we like it: This is a fluorescent tape that is certified by DOT-C2. One thing you would love about this tape is its durability. Thanks to the high-intensity grade glass beads material which is sturdy. The color red and white alternate makes it look outstanding and reflect brightly from far. Do not worry about how to stick it since the process is fast and straightforward. Although pricey, the tape will get the job done effectively. When it comes to adhesion, Reflective Tape Role DOT-C2 Approved Conspicuity Safety Tape by Starrey scores high. Weighing 4.8 pounds and measuring 12.4 x 10.6 x 2.5 inches, the product proves to be a heavy-weight. It’s a self-adhesive product which can stick on a clean, smooth, and dry surface well. You don’t need to be an expert or having prior experience to stick this product on any surface. The process is pretty fast, and it stays in place for as long as three years and over. However, you can peel it off you the need be. Use a dryer to warm it up and peel it off. It comes out without leaving a mark. The reflective part of this tape is a reflection principle of a glass microsphere which has a high refractive index. The design makes it reflect light from all directions and from far away. The tape can be easily detected by a night driver, whether the user is on the road or parked. Starrey company uses sturdy material in making reflective tapes. In this particular item, the company has used weatherproof and waterproof material to keep the tape intact and in good shape for long. It ensures the tape doesn’t get torn under harsh weather conditions. The tape is specially made to help drivers from causing accidents. It is an ideal solution for the police department, firefighting drivers, trailers and trucks. If you want a reflective tape that will improve the visibility at night, Starrey Reflective Tape Role DOT-C2 Approved Conspicuity Safety Tape seems to be your choice. It features weatherproof and durable fabric to enable it to withstand extreme temperatures. Why we like it: Premium Reflective Easy Peel Tape by Reflective Tape Direct is an easy to peel tape that will allow you to apply it seamlessly. It provides high-intensity reflection for high visibility during the day and at night. It shines over 1,000 candles in low lighting and poor weather conditions. The tape is explicitly designed with pressure sensitive industrial adhesion which allows it to stick on the given surface strongly. The easy-to-peel pre-cut strips enable you to place the tape in various and curvy places. Being weatherproof means, it will stay in place even when exposed to rain, snow, and high temperatures. You will enjoy applying the tape since it’s easy to peel and apply. No expertise needed and it only takes a few minutes. After peeling, ensure you stick it fast for long-lasting results. Ensure the surface is upper clean, dry, and smooth to avoid attracting grime and grin which might prevent smooth application. This is a DOT approved tape that has adhered to all visibility regulations. It’s built with bright color with high reflectivity to prevent it from getting dull or fading. The tape shines extremely brightly even on low lighting. You can manage to see it on low flashing. The product is designed to last for as long as it can. It does not fade or get dull. It can withstand extreme temperatures and poor weather conditions. It stays in place and cannot tear easily. Being waterproof means, it cannot come off when exposed to washing or when it comes in contact with solvents like diesel and kerosene. 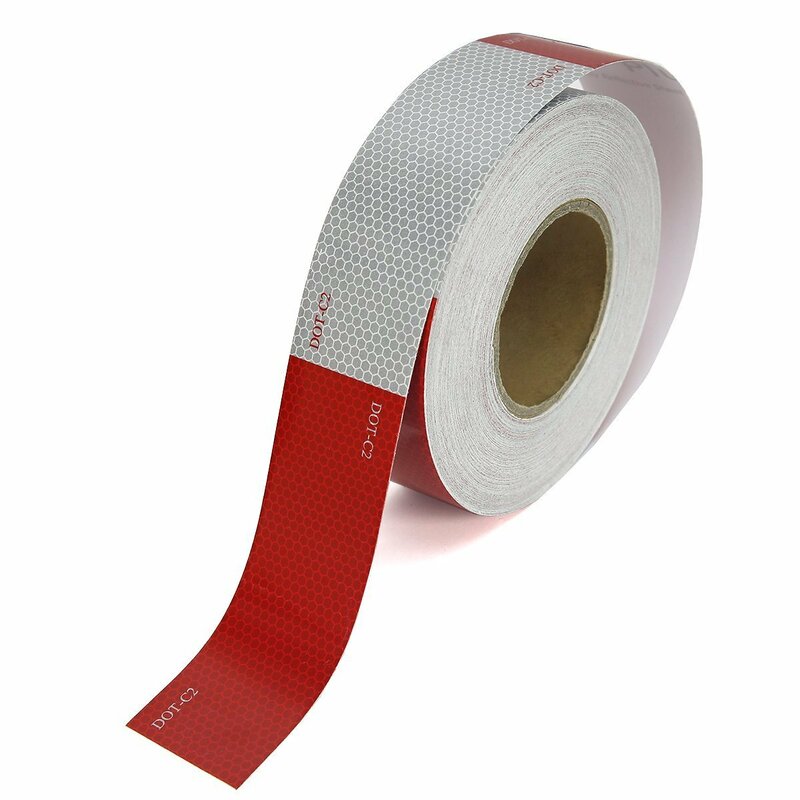 Premium DOT-C2 easy to-peel reflective tape has red and white strips to allow it to be seen from far. This enables it to be used on various surfaces. It works great for campers, boats, and trailers. You can also stick it on your mailbox to prevent to alert drivers at night. Other applications include trucks, vans, cars, and motorcycles. Premium DOT-C2 reflective tape is an ideal solution for individuals working on a low budget. It will prevent your car from being hit when-on road or when parked. Why we like it: This is a genuine 3M brand 3150A Solas grade that comes with a continuous role measure of 2″ wide and 6 feet long. It can be used on a bicycle since it can adhere to the frame curves. It’s a pressure adhesive film to make the product stick smoothly and firmly. You will be wowed at how it can stick on a curved surface like on helmets and even on bicycles since it adheres to curves. 3M Scotchlite 3150A is an easy-to-apply film. You can stick it on both flat and curvy surfaces. For smooth and easy application, clean the surface to clear grease, grime, and dirt. Air dry the surface and stick it- hassle-free. The tape comes in one bold color to allow easy customization. It is highly reflective and can be seen from miles away. It reflects under low lighting and poor weather conditions. Do you want a film that will stay intact for more than three years? Well, this is the real deal. It is made of sturdy material to enable it to withstand high temperatures. Of all the tapes we have reviewed, this is the most versatile film. It can be used even on curved smooth surfaces. It doesn’t out stick. Great for cars, boats, campers, trailers, mailboxes, and guard-rails. If you have been looking on a tape that will adhere to frame curves of your bicycle, then your hustle ends here. It is not only inexpensive but durable and highly reflective too. The lower rear area of a Trailer – The rules requires that the rear of semitrailers and trailer be equipped with reflective tape. It should be positioned horizontally to extend across the full width of the trailer. Sides of the Trailer – The conspicuity tape needs to be applied on both sides of a semitrailer or trailer. The length should be at least half the size of the trailer. The places between the segments must be distributed uniformly as practicable. The rear of the Truck – Truck tractors are required to be equipped with white and red reflective tape similar to that of trailers. It increases nighttime conspicuity. The upper rear area of a Trailer – DOT regulations requires two pairs of white reflective tape to be applied horizontally and vertically on both right and left corners of a trailer. Reflective tapes are highly versatile as long as you get the right one. Take advantage of the following factor to choose the right product. Despite the intended purpose of the reflective tape, remember that their color depicts a specific use. Therefore, it is crucial to understand the meaning of each color to help you get the best use of it. Striped black and yellow warn people when entering a specific area. The wide, yellow reflective tape is used on forklifts or lanes for pedestrian traffic. Red and white are widely used on vehicles, trailers, and trucks. However, for personal purpose, you can use fluorescent or white colored DOT reflective tape. There is standard glass bead type which is widely used on helicopters, street signs, bicycles, and police cars. This type comes in three distinct variants: engineer, economy, and commercial. The other alternative is a more expensive type which is enclosed lens microprismatic sheeting. It uses modern technology making it reflect brightly than regular reflective tape. Your need will dictate the type of reflective tape to buy. If you want to use it on your mailbox, you can opt for standard glass bead type, the economy category which is less expensive. For trailers, boats, and trucks, the microprismatic sheeting will be an ideal choice since it’s highly visible to prevent accidents. Reflective tapes come in different prizes. The price factor is determined by the material used. Well, you won’t want to break your bank for a reflective tape to stick on a mailbox or at the back of your jogging jacket. Rummage through the internet and look for companies that offer the same to affordable prices. There is a plethora of reflective tape products in the market. Choosing the right product can be unnerving if you’re not aware of what you want and what to look for. Confusion can lead you to buy a low-quality product. To get the best DOT reflective tape, remember to keep in mind color and type. They are the core factors that will guide you in making the right choice.